A few weeks ago I had an opportunity to join a conversation between JISC and MIT OEIT (http://oeit.mit.edu/) to exchange information about current initiatives and possible collaborations. The general themes of the conversation were openness and sustainability. There was an agreed sense that, currently, “Open is the new educational tech” (Vijay). The areas of strategic interest, competencies, and knowledge of open institutes are now central to much educational development. JISC’s work in many diverse areas has contributed to the growth of openness both the successive programmes of work connected to repositories (including the cultivation of developer happiness) and more recently the JISC and HEA OER programme. Vijay outlined some of the thinking that MIT OEIT are doing around innovation and sustainability outlining where they fit in that cycle and the limiting dependencies of innovation. In a four stage innovation cycle. MIT OEIT are mostly involved in the initial incubation/ development phase and the early implementation phase. They’re not in the business of running services but they need to ensure that their tools are designed and developed in ways which are congruous with sustainability. One key point in their analysis is that the limiting factor for innovation is not your organisational growth (whether the size of the project, design team, or facilities) but the growth of nascent surrounding communities in other parts of the value chain. As a result, MIT have found that sustainability and embedding innovation isn’t just about more resources it’s about basic design choices and community development. Openness and open working allows the seeding of the wider community from the outset and allows a project to develop competencies and design skills in the wider community). This resonates with some of observations made by OSS Watch and Paul Walk. We then discussed the success of the Wookie widget work carried out by Scott Wilson (CETIS) and how that has successfully developed from a JISC project into an Apache Foundation incubator http://incubator.apache.org/wookie/. Brandon then highlighted the SpokenMedia project (http://spokenmedia.mit.edu/) creating tools to automatically transcribe video of lectures both for to enable better search and to make materials to be more accessible and scannable. The tools achieve up 60% base accuracy and are trainable up to 80% accuracy. MIT hope this will make lecture video significantly more browseable and are exploring the release of an api for this as an educational service. We then discussed some projects working in areas that support bringing research data into curriculum. MIT have a series of projects in this area under the general name of STAR (http://web.mit.edu/star/) which provide suites of tools to use research data in the classroom. One successful implementation of this is STARBioGene allows Biology students to use research tools and materials as part of the core curriculum. Some of the STAR tools are desktop applications and some are cloud-based, many have been made open source. The wider uptake of the project has contributed to the development of communities outside MIT who are using these tools – as such also it’s an example of growing the wider uptake community outlined in their innovation cycle. One consideration that it has raised about communities of use is that some of the visualisation tools require high performance computing (even if only needed in small bursts). The trend toward computationally intensive science education may create other questions of access beyond the license. RRT are attending Open Repositories 2009 in Atlanta. 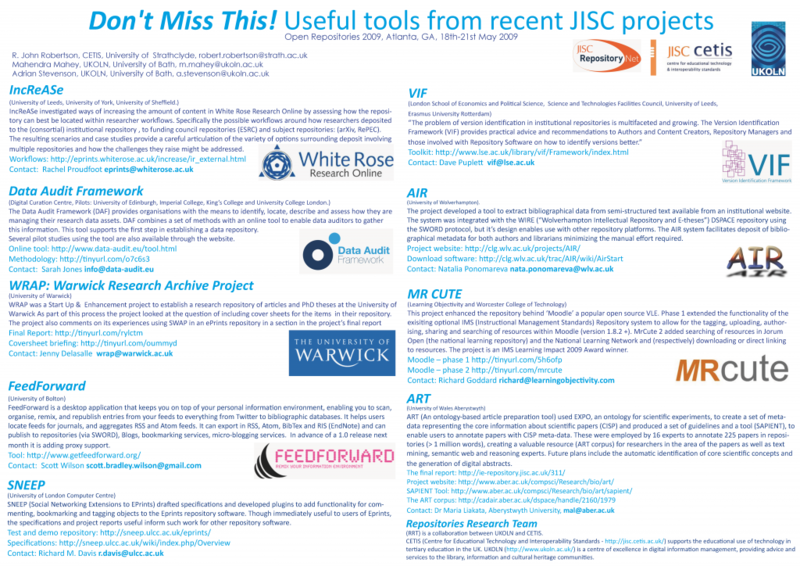 Our poster highlights nine recent ready-to-use outputs from JISC’s repositories and preservation work that the conference might not otherwise have heard about. Over on the IE blog Andy McGregor has a useful annotated list of some of the online tools that he has used to help with programme management. Many could be just as useful projects – distributed or not. On a related note David Flanders has a useful and extensive reflection and how to guide on contracting out software development. At the end of this week JISC’s Common Repositories Interfaces Group (CRIG) are holding a two day meeting to look at the key scenarios affecting repository interfaces. Our discussions for the two days are going to build on a series of teleconferences organised by the CRIG support project – WoCRIG which have just been podcast. I’m both excited about this meeting and a little nervous. I think that the support project are doing a good job of stirring us up to move forward the work of CRIG and helping us engage with and shape the next stages of repository interface interoperability. For the next stage of this work, this meeting, they’ve organised an unConference. Two days of informal thinking, discussing, and getting at the core of the interoperability issues related to repositories. I’m looking forward to it for what I know I’ll learn, for the chance to contribute, and for the chance to actually just have time to sit down and talk about these things. The nervousness on my part comes from the unknown – I’ve never been to an unConference before and although the idea is good – to have discussions about what people want to talk about and to cut out the fairly predictable presentation part of a meeting and so to get at the eureka moments that usually happen alongside but not actually in conferences – I’m aware of how much, for me, those eureka moments come along because I’ve been sitting for extended periods of time for my mind to go off at tangents while half listening to a presentation which may or may not be relevant to my thoughts. Anyway I guess it’s a bit like a codebash for ideas – and that’s no bad thing.